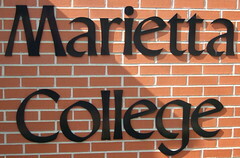 As the final day of classes ends and we meet the weekend, finals are only jsut around the corner.Â While I’m sure most Marietta College students are sitting around studying all weekend, I wish the best to those who have finals to take. Remember that the Midnight Breakfast is Sunday night at 11 PM through 1 AM.Â Bring a canned good, or you’re SOL when you get to the door. Congrats to the Men’s Basketball team for beating Denison.Â If you’re looking for a study break, they’ll be playing Ohio Northern Saturday at 3 PM.